A Love Affair was originally published as Une Page d’amour in 1878. It’s probably considered one of the minor books of the Rougon-Macquart series but I was pleasantly surprised when I read it. As with many of these lesser known books of R-M, Zola likes to experiment with the structure and he often has a limited number of characters. 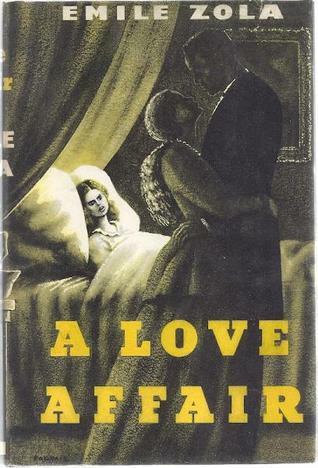 A Love Affair is split into five parts and each part is split into five chapters; the end chapters are often highly descriptive and impressionistic, they sometimes have a cinematic feel to them. Chapter Five of Part Four is one such piece; it reminded me a bit of Polanksi’s Repulsion or the obsessiveness of Proust. I would liked to have included the whole chapter as the excerpt but that may have been considered a bit excessive. The chapter would work well as a stand-alone short story and as such little background details of the novel is needed to read it. Jeanne is a sickly twelve-year old girl who has been left alone in her apartment by her mother, Hélène, an attractive young widow. Hélène has left Jeanne on her own in order to meet up with her lover Henri. Jeanne sat staring at the door, very unhappy, at her mother’s abrupt departure. She turned to look around her; the room was empty and silent, but she could still hear noises going on, footsteps hurrying away, the rustle of a skirt, the landing door slammed violently. Then the noises stopped. And she was alone. All alone, all alone. Her mother’s wrapper, casually flung down, was sprawling on the bed, the skirt spread out, one sleeve lying across the bolster, in the curiously crushed attitude of somebody who had collapsed there sobbing, emptied, as it were, by boundless grief. Underclothes lay strewn about, a black fichu made a patch of gloom on the floor. And she was all alone in the untidy room, where the chairs had been pushed about and the table thrust in front of the wardrobe; and she felt tears choking her as she looked at that wrapper, with her mother no longer in it, stretched out in corpse-like thinness. She clasped her hands and shouted for the last time: `Maman, maman !’ But the blue velvet curtains muffled her cry. It was all over, she was alone. …and Jeanne started vaguely dreaming about all the people she had loved, since she had first come into the world. Her oldest, dearest friend in Marseilles had been a huge, heavy ginger cat; she used to pick it up with both her arms clutched round its stomach, and carry it thus from chair to chair, and it never got cross; then it had disappeared, and that was the first cruel thing she could remember. Then she had had a sparrow, and that had died; she had picked it up one morning on the floor of its cage; and that made two. And then there were her toys, that got broken on purpose to make her unhappy; it was all most unfair, and she was such a silly that it upset her dreadfully. One doll in particular, no bigger than her hand, had driven her to despair by getting its head smashed; indeed, she was so devoted to it that she had buried it secretly, in a corner of the yard; later on, seized with a longing to see it again, she had dug it up, and the sight of it had made her sick with terror, it was so black and hideous. It was always the same; other people gave up loving before she did. They got spoilt, or else they went away; in any case, they were partly to blame. Why did it happen so? She herself never changed; when she loved anyone, it was for life. She could not understand desertion; it was something so huge, so monstrous that the notion of it made her little heart break. The slow dawning of confused awareness in her mind sent a shiver through her. So, one day, people parted; they went their separate ways, they stopped seeing one another, they stopped loving one another. And she sat gazing out over the huge and melancholy city, horribly depressed by these glimpses of life’s cruelty revealed to her passionate twelve-year-old heart. She felt as if everything was finished; she realized that she must be growing very old. Let time pass, now; she had stopped looking back into the room. She was forgotten and alone, but she no longer cared. Her childish heart was full of a despair so deep that all around her seemed black. Perhaps she would be scolded for it, as she used to be scolded when she was ill; that would be terribly unfair. It was a burning pain within her, it was something that gripped her like a headache. Surely, a few moments ago, something had broken inside her; somebody had done that to her. She couldn’t help it; she had to let them do what they wanted to her. She was really too weary. She sat with her little arms folded on the window-sill and her head leaning on them, overcome with drowsiness, but opening her eyes wide from time to time to watch the downpour. Now, I realise that some people will find this especially cloying, mawkish even, but I feel that Zola handles it brilliantly and it made me realise that Zola rarely gives us a child’s view; the only other one I can think of is when we see Gervaise through young Nana’s eyes briefly in L’assommoir. 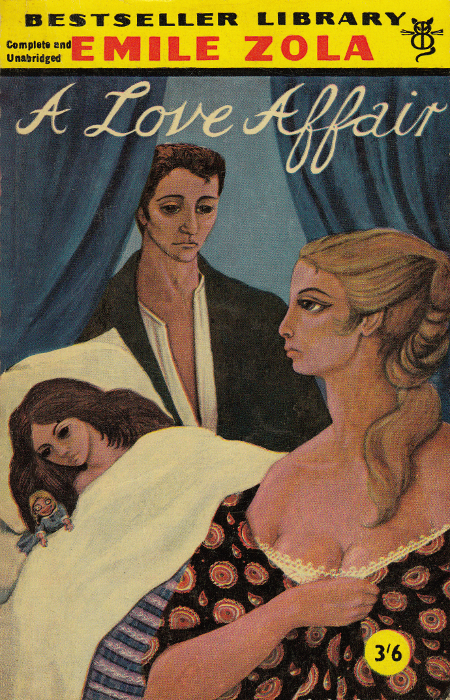 The excerpts were taken from A Love Affair, which was translated by Jean Stewart and published by Elek Books in 1957. It has also been translated as A Love Episode and A Page of Love. This has been cross-posted on The Intermittencies of the Mind blog.